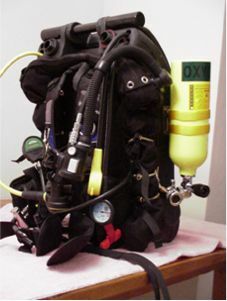 Philippe sent me his excellent story how he rebuild his Azimuth rebreather to a KISS style operated CCR. Thank you Philippe for your contribution! You can see the left side of the rig: O2 tank and Apeks DS4 first stage, Air2 hooked up to bottom tank, bailout regulator 2nd stage hooked up to top cylinder and the Oxygauge. I also use a VR3 with the external cell for PO2 monitoring (not presented on this picture). 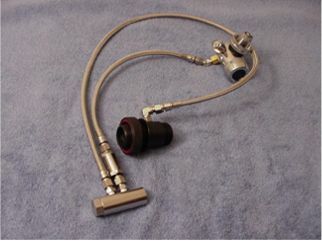 The kiss valve is added next to the original dosage bloc of the Azimuth. This configuration allows me to have 2 diluent tanks both hooked up to OC for bail out. I changed the MR12 threads and tank valve of the top tank to DIN threads allowing me to use the top tank as the O2 tank with the Apeks DS4 for shallow dives or travel. But being in the USA, I found it difficult to get an O2 fill in my Faber 4 litre steel cylinders which are not DOT stamped and with a valve that does not feature a burst disc. So I decided to go for the second set up as shown below. The Mares MR12 and the blue feed line are removed. The input port on the dosage bloc is plugged. The picture on the left presents the other set-up, obviously more streamline. This is the configuration I now dive most of the time. I simply used the Apeks DS4 as O2 addition is to be done with Gordon Smith’s Kiss valve. 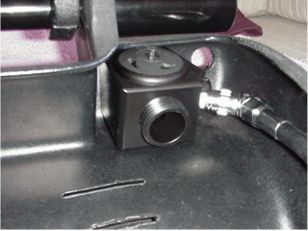 The machined Delrin plug is installed to block the ambient pressure chamber of the first stage because the system requires a constant pressure regulator. An overpressure relief valve is added here since the O2 add valve won’t vent the excess pressure if the regulator fails but is more likely to undergo “rapid-non-passive disassembly” (as per Gordon’s own words) instead. Button-type high pressure gauge is presented here. I use a Catalina 13 cuft. 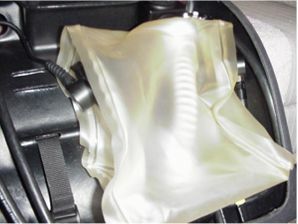 The tank is attached with a quick release bracket on the left side of the shell. 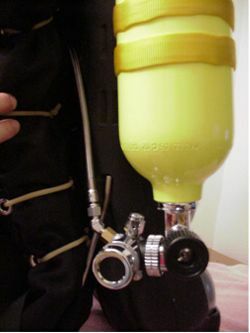 The 02 addition line is made using components sourced from Gordon Smith together with the Swagelok fittings as used in his KISS rebreather. It continuously injects a small trickle of 02 into the loop at slightly less than the divers metabolic use rate. 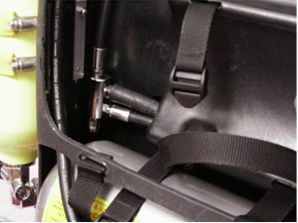 A manual addition button is included for the diver to replenish the loop with O2 and get back to the chosen PO2 set point. I chose to feed 02 in the exhale side of the loop as it gives time to the O2 flow, both continuous and manual addition, to mix with the diluent. 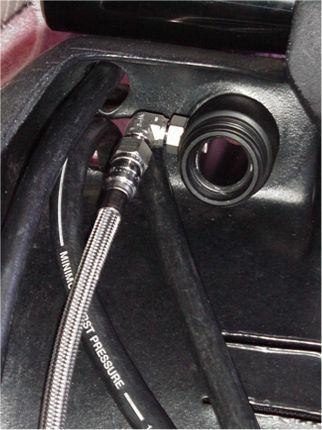 I used a Swagelok fitting plugged into the fitting that was originally used on the inhale side (I removed it from the inhale side as I added the ADV, see below) to connect the hose to the inhale counterlung. The adjustable OPV is removed as the exhale counterlung features a BC type spring loaded OPV that would do its job in case of ascend on OC. Bob Howell’s ADV has been fitted on the inhale counter-lung. The ADV is hooked up to the Ray manifold that I added to the rig. The fitting that was originally here is now used to feed O2 on the exhale side (see above). I used the manifold that is fitted on the Dräger Ray to rearrange my hoses. 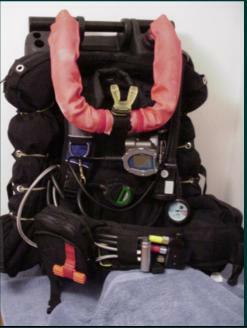 BCD / AIR2, dry suit inflator and ADV are hooked up here. 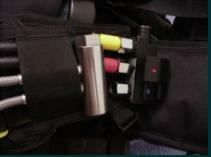 I added one P-ports on each side of the inhale counterlung to monitor the PO2 with an Oxygauge (right side of picture) and the VR3 computer (opposite side of the counterlung, left on the picture). 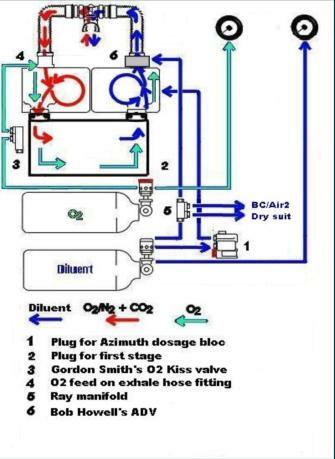 This is the schematic diagram of the rig with the on-board O2 cylinder as shown on the photograph above. WARNING! 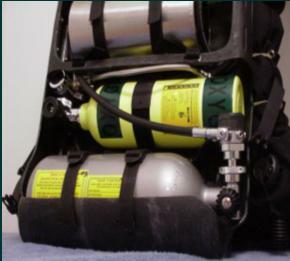 REBREATHERS CAN AND DO KILL YOU. The material presented here is for information only. It is not a construction plan for doing this yourself. IF YOU ATTEMPT TO MAKE MODIFICATIONS TO YOUR SYSTEM, YOU DO SO AT YOUR OWN RISK. I take no responsibility for your abilities, construction skills, material selections or your judgment of your own diving skills. You have been warned !! !